Soft and fluffy flattened rice thats traditionally served for breakfast, often with cutup jalebis. Delicious deepfried puff bread served with spicy curried potatoes. The Steamed Sweet Corn is a simple and very healthy recipe that is packed with flavors of chaat masala and black salt. Sweet corn either steamed or charcoal grilled is a favorite street food of India and we simply enjoy it more during the monsoons. This recipe is healthy and makes a great afterschool snack for kids too. 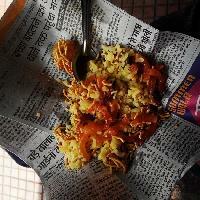 Thecapital of Indiais one of the best place to have street foods, Delhi offers variety of road side food and stalls. Cholebhatureis a Punjabi dish but very popular in major urban cities of India. 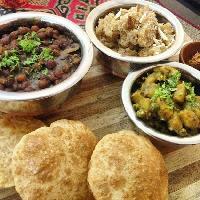 Delhi is well famous for best cholebhature, commonly eaten for break fast or snacks other famous road side food from Delhi are rajma chawal, prathe and most famous mouth watering snacks item chaat. The royal state of India,Rajasthanis well famous for its awesome cuisines and delectable street foods. Its famous Bikaneri kachori and popular mirchi bada are the most favorite amongst the locals, and found in almost every street shop or stall. The desert state also known for its most popular dalbaatichurma, pakores and mawa, famous desert from alwar. The most popular street food originate from the Kutch region of Gujarat and travel across street of ,Puneand other cities of India. Dabeli is a very popular and fantastic spicy snacks item made by boiled potatoes with a special dabeli spices and putting the mixture between the pav. Egg Rolls are one of the most popular of all street foods in Kolkata. A fried egg wrapped inside a paratha served with chutney or sour dipping sauce in many roadside stalls. Another famous street side food item in Kolkatta is phuchka or golgappa. The specialty of state is akki roti, A spicy bread made from rice flour and server with coconut chatney. The delicious street food is one of the most popular and common tiffin snack quick to make and tastes so good. The specialty of food street in banglore is dosa, there is a huge variety on dosa served here, other food items are sambar,rasam and curd rise. The most favorite south Indian dish, common asbreakfast itemand served with combination of chutney and sambar. Sambhar which tastes so good with idlis and vadas is made with tamarind and pigeon peas. Idlis and vadas sambhar are the best food in the streets of Chennai, Tamil Nadu. The famous Hyderabadi style mirchi bajjis is a common snack or appetizer, stuffed green chili fritters. Though mirchi bajjis are found with different stuffings from at different regions in India but Hyderabadi style mirchi bajjis are the best one to have. Hyderabad is also famous for its Biryani, dosa, idli and Bonda.